Figure 16-4: Lumbar herniated disk; left S1 radiculopathy. Sagittal T1-weighted image on the left with arrows outlining disk margins. Sagittal T2 image on the right reveals a protruding disk at the L5-S1 level (arrows), which displaces the central thecal sac. Degeneration of the intervertebral disk without frank extrusion of disk tissue may give rise to low back pain only. There may be referred pain in the leg, buttock, or hip with little or no discomfort in the back and no signs of nerve root involvement. 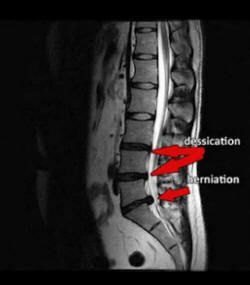 Lumbar disk syndromes are usually unilateral, but large central disk herniations can cause bilateral symptoms and signs and may produce a cauda equina syndrome. Breakaway weakness describes a variable power of muscle contraction by a patient who is asked to provide maximal effort. The weakness may be due to pain or a combination of pain and underlying true weakness. Breakaway weakness without pain is due to lack of effort; patients who exhibit breakaway weakness should be asked if testing a specific muscle is painful. In uncertain cases, EMG can determine whether or not true weakness is present. The differential diagnosis of lumbar disk disease includes a variety of serious and treatable conditions, including epidural abscess, hematoma, or tumor. Fever, constant pain uninfluenced by position, sphincter abnormalities, or signs of spinal cord disease suggest an etiology other than lumbar disk disease. Bilateral absence of ankle reflexes can be a normal finding in old age or a sign of bilateral S1 radiculopathy. An absent deep tendon reflex or focal sensory loss may reflect injury to a nerve root, but other sites of injury along the nerve must also be considered. For example, an absent knee reflex may be due to a femoral neuropathy rather than an L4 nerve root injury. A focal decrease in sensation over the foot and distal lateral calf may result from a peroneal or lateral sciatic neuropathy rather than an L5 nerve root injury. Focal muscle atrophy may reflect loss of motor axons from a nerve root or peripheral nerve injury, an anterior horn cell disease, or disuse. An MRI scan or CT-myelogram is necessary to establish the location and type of pathology. Simple MRI yields exquisite views of intraspinal and adjacent soft tissue anatomy and is more likely to establish a specific anatomic diagnosis than plain films or myelography. Bony lesions of the lateral recess or intervertebral foramen may be seen with optimal clarity on CT-myelographic studies. The correlation of neuroradiologic findings to symptoms, particularly pain, is often problematic. As examples, contrast-enhancing tears in the annulus fibrosus or disk protrusions are widely accepted as common sources of back pain. However, one recent study found that over half of asymptomatic adults have annular tears on lumbar spine MR imaging, nearly all of which demonstrate contrast enhancement. Furthermore, asymptomatic disk protrusions are common in adults, and many of these abnormalities enhance with contrast. These observations strongly suggest that MRI findings of disk protrusion, tears in the annulus fibrosus, or contrast enhancement are common incidental findings that by themselves should not dictate management decisions for patients with back pain. The presence or absence of persistent disk herniation 10 years after surgical or conservative treatment has no bearing on a successful clinical outcome.